For the last eight years the Lord has given me a unique opportunity to serve churches in the role of an interim youth minister. 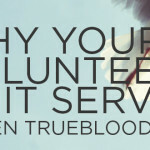 I have had great experiences in the churches that I have served. What has been interesting is the level of crisis that I find when I go into a new church. Whether it is something as simple as overzealous youth workers to something as difficult as the suicide of a student, crisis can come in all shapes and sizes. One thing is for sure, how we handle crisis in ministry can define our tenure in that specific ministry. 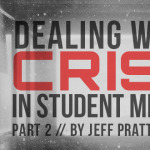 In this two-part series, I will try to give you several key points to think about as you deal with crisis in student ministry. Remember, it’s not if it comes, but when it comes. In our effort to minister to and serve sinful humanity, some type of crisis is inevitable. The first thing you must know when a crisis hits is how and where it will affect your ministry. How and where it affects your ministry will determine how you deal with the crisis. When a crisis hits, it will directly affect the culture of your student ministry. When you think about the culture of your ministry, think about those intangibles that hold everything together. It is what you believe as a group; it is what you have determined to be valuable as a group; it is how you interact with each other within your group. When a crisis hits it can send a shockwave through your ministry and affect the way that students interact with leaders and each other. Since crisis hits your culture, deal with it relationally. Emails and social media are fine and will serve as great vehicles to communicate messages to your group, but deal with people. Make sure that you value what is valuable in this moment. Second, you have to make sure that you gather all of the information before you begin to communicate. Regardless of the crisis there is going to be information that needs to be gathered. One of the worst things we can do is react to something that one person has told us without attempting to corroborate the information. Once a crisis has been identified, go to your Pastor and make sure he is the first one in your communication loop. Do not attempt to deal with crisis on your own or within your student ministry leadership team. The pastor should know what is going on and will be a great help to you as you work through the issue. Now that you have talked with your pastor and gathered the right information, two suggestions need to guide you as you move forward: know what to share, and know how to share. Many times in crisis there will be situations where you cannot divulge the entire story. It may be legal issues, privacy issues, or a level of information that your pastor wants you to communicate. Whatever it is make sure that you have vetted your communication through your pastor and you both agree on what needs to be shared and not shared. Second, know how to share it. Think through what environment will best suit the type of information that will be shared. Once the environment\time is selected, make sure that your posture and tone communicate the seriousness of the moment. I know this might sound elementary, but what you wear and how you handle yourself in that moment can speak louder than our words. Many of us have a default mechanism that we go to when we are put in a difficult or uncomfortable situation. It could be humor or something as simple as repeating words. I would encourage you to write down what you are going to say. Practice it several times and make sure that you are comfortable with the content. This is not a time to “wing it” or pull something out of the hat. It may feel impersonal but in that moment you need to be concerned with accuracy and integrity of your message. There are a couple of other issues that we need to look at as you deal with crisis, and we will discuss those in part 2.